Love the half makeup looks? Then this idea is for you! Here we have a design that features pretty makeup on one side and dark pumpkin makeup on the other. 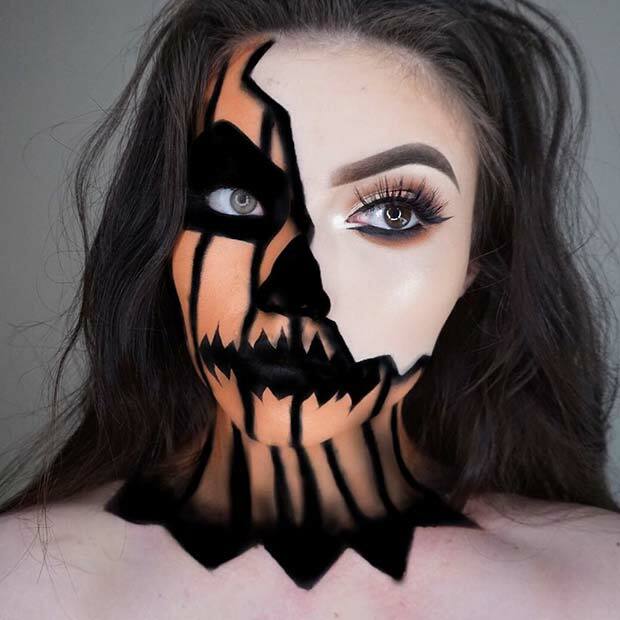 This is such a fun and spooky look, perfect for Halloween. You can use any pumpkin design for this. Sugar skull makeup is so popular at Halloween and with designs like this one we can see why! This makeup is simpler than some of the other sugar skulls but it still looks spooky. You can find tutorials online to help you achieve the look. 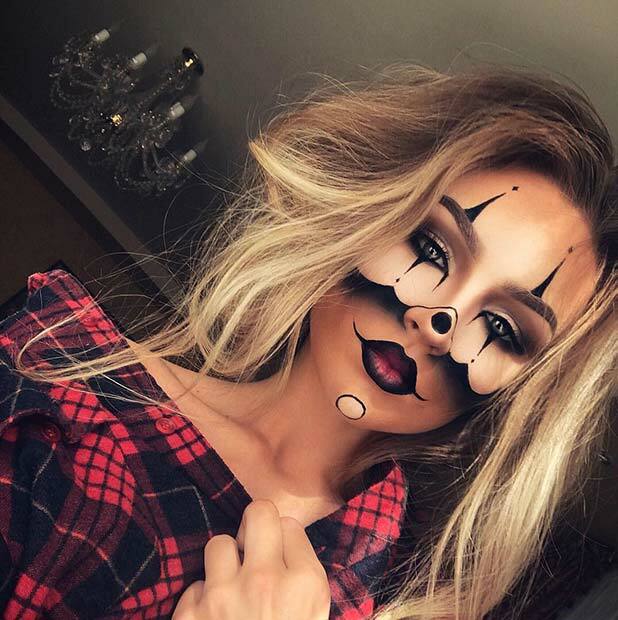 Makeup like this would look amazing for any Halloween celebrations from a party to a night out. 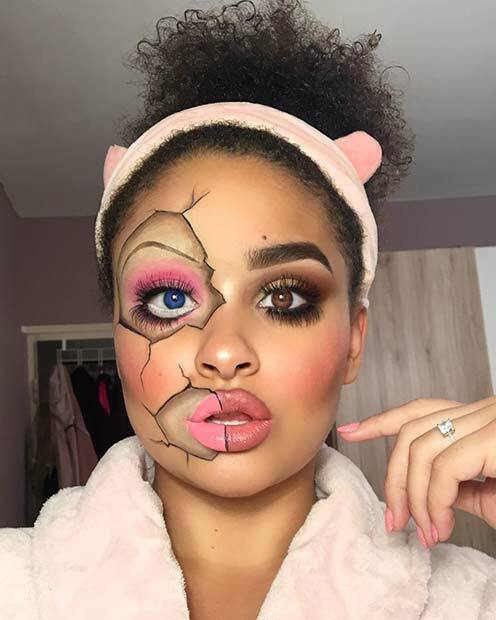 Cracked doll makeup looks very creepy, so we couldn’t let Halloween pass by without featuring one of the designs. This artist has created an awesome doll design. She has created cracks on the face and the cracked pieces are in a different color. One of her eyes is also a different color and has different eye makeup. You can find all the products used on the page featured below. Next, we have another popular makeup idea. This one has been inspired by Harley Quinn. It is one of those designs that is instantly recognized. The look is quite simple to recreate and would be a hit at any Halloween party. You don’t need the exact outfit with this, just wear something similar as everyone will know who you are anyway. Our next idea is a pop art style zombie. Pop art usually involves bright colors and cartoon style designs. It is such a cool and creative idea. 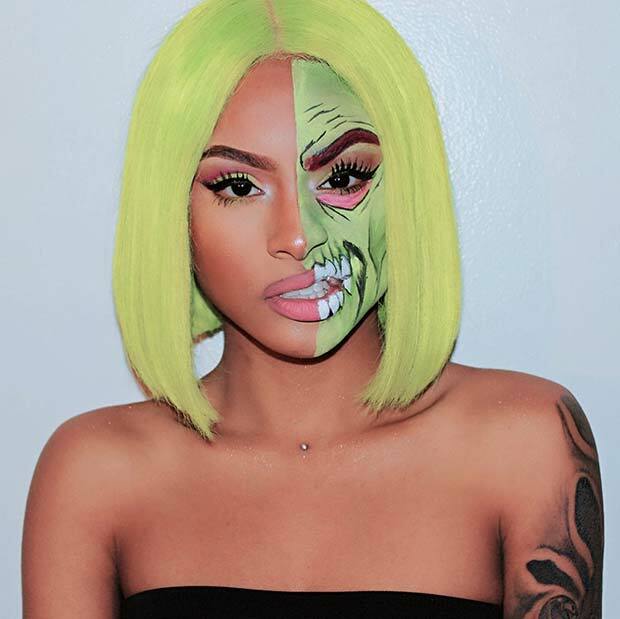 Take inspiration and recreate a similar look or try your own pop art zombie with any colors of your choice. 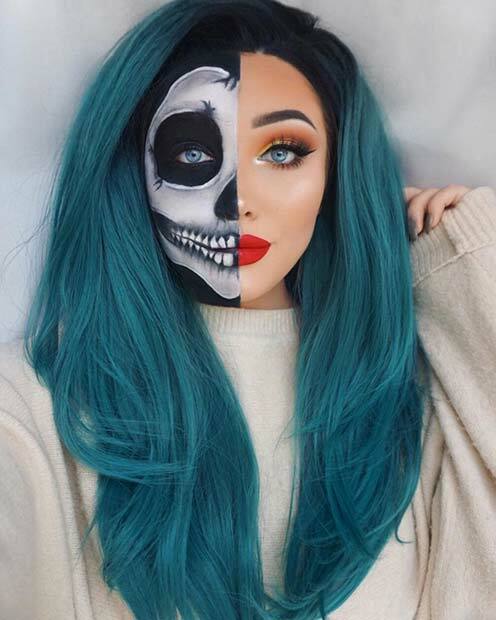 Use the half design or try the whole face for a bold Halloween look! Creep everyone out this Halloween with a clown makeup design like this one. It has all the classic clown features like the nose, eye design and lips but it uses dark colors. The dark colors give it a spooky, Halloween look. As the makeup is more neutral instead of the bright circus clown style, you can wear the makeup with any outfit. 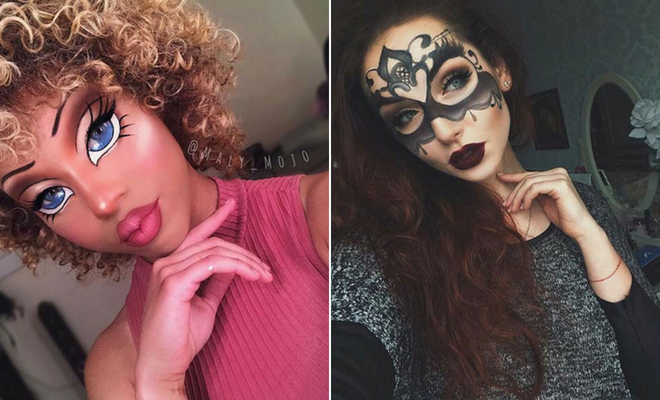 Want to join in with Halloween but don’t want makeup that is over the top? Then this idea is for you. 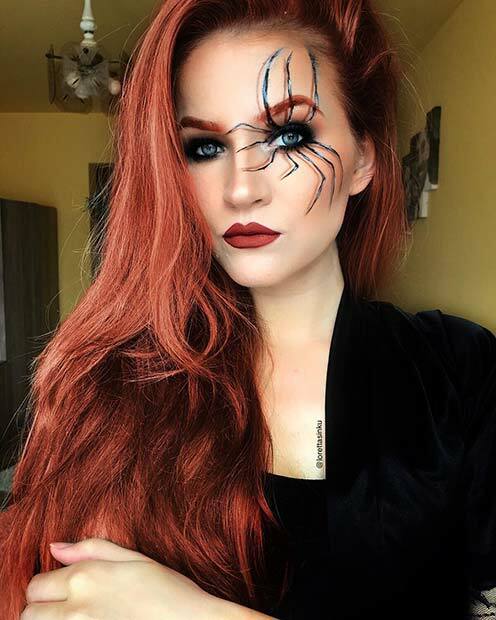 This artist has beautiful makeup with a spider design. There are spider legs coming out from the eye. This is a simple but spooky idea that allows you to look glam but have fun on Halloween too. Next, we have another scarecrow idea but this one is simpler. Instead of the bright colors and more intricate stitching, this one has fewer colors and uses a simple stitch design. This is easy to recreate and would be great if you are new to makeup and don’t want anything complicated. It is also great for any last minute Halloween costumes. 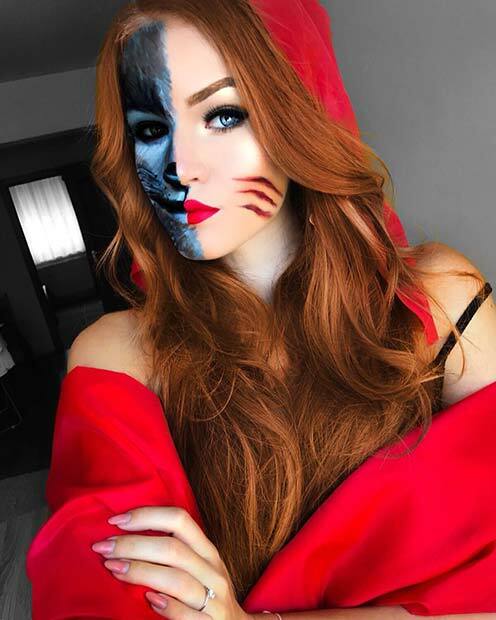 Little Red Riding Hood is a classic fairy tale and this next makeup idea has been inspired by it. The artist has created a half design with Red Riding Hood on one side and the wolf on the other. You can recreate this or just Red Riding hood or just the wolf. 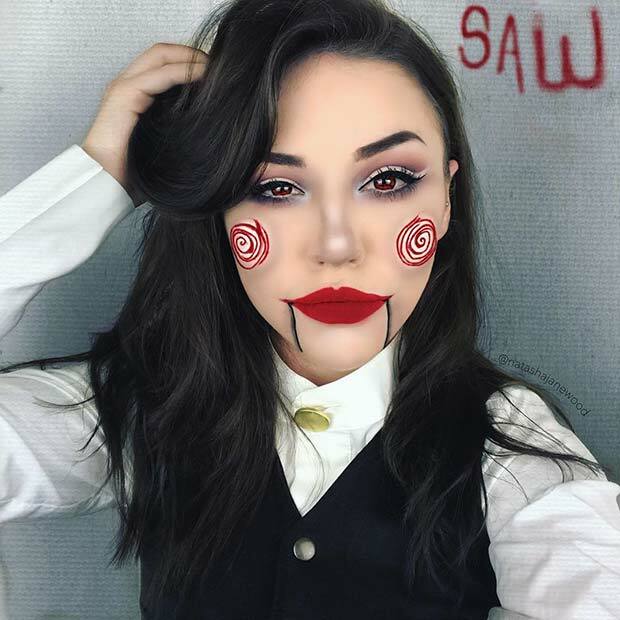 Saw is one of the biggest horror movie franchises so it is no surprise that it has inspired many Halloween costumes. This artist has created a makeup look based on the puppet Billy from the movies. This is quite a simple look but everyone will know what it is, and it will give everyone chills. Next, we have a masquerade makeup. 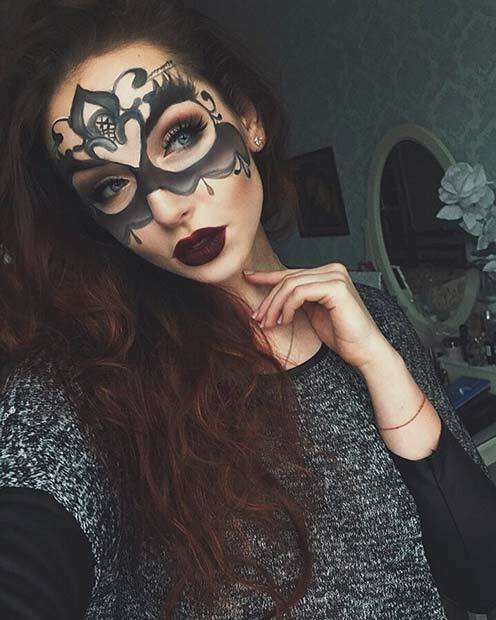 This mask has been painted on her face with makeup. We love this idea because you can create a simple mask or an intricate one. It also makes you look instantly ready for Halloween and you can wear it with any outfit. Looking for quirky and unique Halloween costumes? Then this is for you. 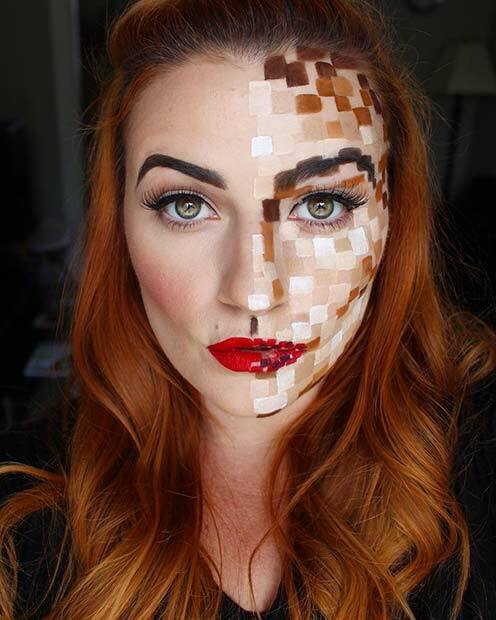 This artist has created a pixelated design on her face. She has used different colored squares to give her a pixel look. You can recreate this in any color palette. It is a simple but different makeup idea that will be remembered. Last on our list of Halloween costumes is this half skull makeup idea. 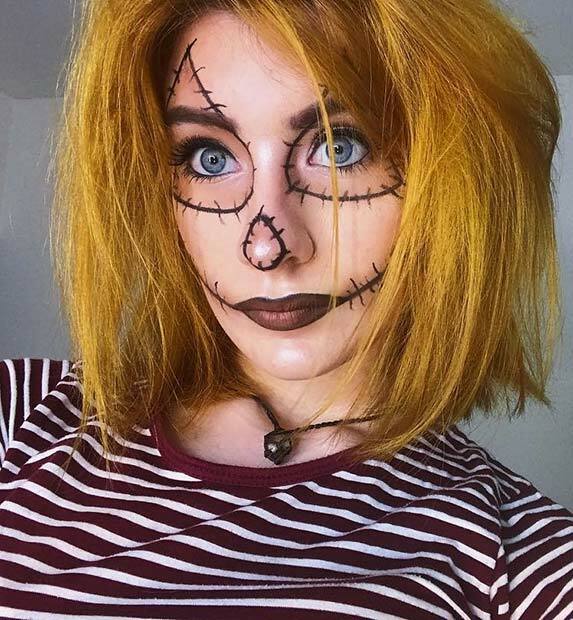 One side of her face features gorgeous makeup and the other has a spooky skull design. You can see all the products used to achieve the look on the artist’s page featured below. This would look amazing for any Halloween celebration. 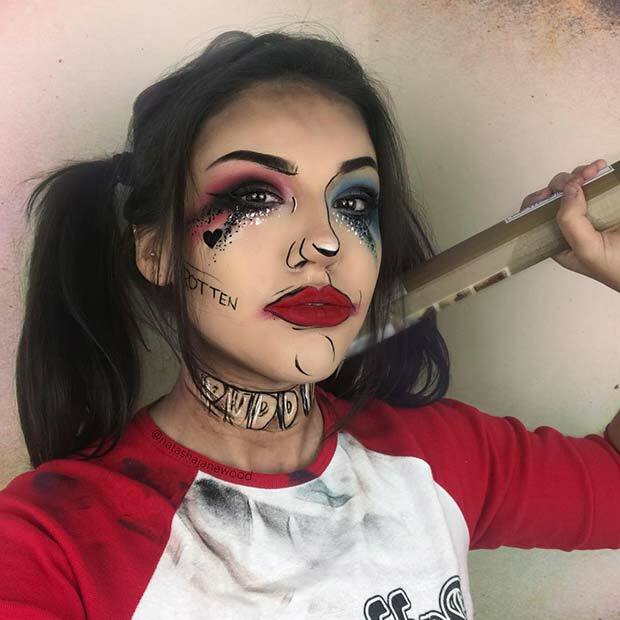 We hope you have found inspiration from these easy Halloween costumes and makeup designs!